A well as features, there is news from the UK and abroad, plus reviews of choral and organ CDs, books, concerts, new organ music, new installations, letters, and more. 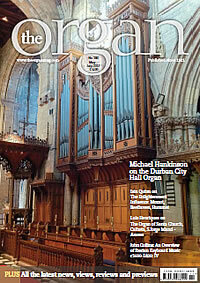 To subscribe, or receive a complimentary copy if you're new to The Organ, visit our subscriptions page. All content © Musical Opinion Ltd.